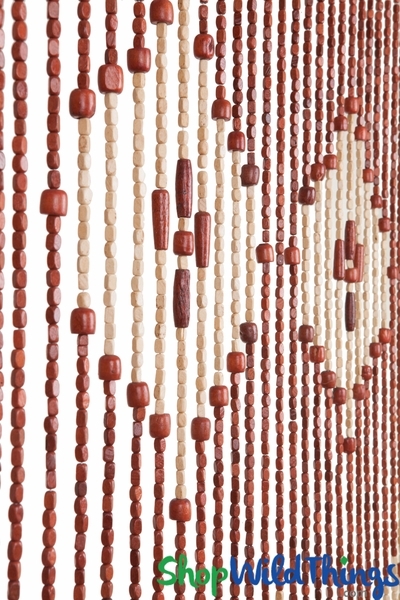 Add depth and style to any room by simply adding our new Wood Beaded Curtain "Jax"! This finely constructed curtain has a distinctive pattern in colors that complement most color schemes. 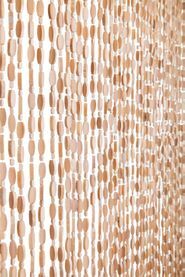 Beaded curtains are a trendy accent piece to add to any Decor and within minutes, you have a room divider, a wall hanging or a backdrop for parties and stages and they look great hanging loose or tied back. There are 27 strands hanging from a decorative woven design and the earthy colors of cream and brown are used to create a classy pattern of 4 diamonds with a zigzag in the middle. The dark brown head rail is 35.25" wide and has 2 eyelets for out-of-the-box hanging. The strands are about 1.5" apart and the entire curtain is 69" long. Due to the use of natural materials, the beads are not perfectly exact so expect some slight variances in the strand lengths. Just as described love it very well satisfied! They were everything that I wanted & more. Thank you ! The curtain was too wide for our 30inch opening. Since it has a chain stitch we could not just cut off the extra 6 inches but my husband carefully cut the board one inch at a time so he wouldn't cut the string, and then he loosen string from board before he cut off extra 6 inches. He tied and glued string on remaining board. It looks beautiful! I love my bead curtains. They are a beautiful addition to my home. I was concerned that they'd be too short, but they are perfect. Great product at affordable prices and delivery time was amazing! Perfect for the what I wanted it for. I wanted something see-through but gave the impression of a door. This fit the bill perfectly! It was delivered very quickly, it was inexpensive and pretty!